It wasn’t to be for FC Barcelona as their season comes to an end. The fourth game of the semifinal play-offs against Baskonia ended with a narrow 88-82 defeat. 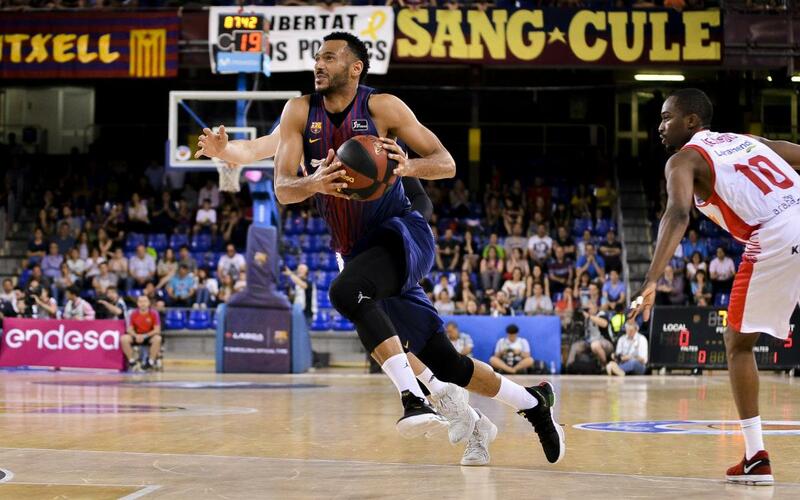 The blaugranes were very close to forcing the fifth game of the series as they clawed back an 11-point disadvantage in the final five minutes of normal time. The Palau Blaugrana was lively for extra-time but Pedro Martínez’s side ended up securing their place in the final at Barça Lassa’s expense. Barça were behind for the opening twenty minutes but they were within touching distance throughout. The game didn’t start well for the blaugranes as they fell five points behind early on. Barça responded by staying in touch and getting to within three points of the opposition (22-25). However, Shengelia scored twice and then two three pointers from Timma and Beaubois, opened up a ten-point lead which hurt the blaugranes at the stroke of half-time (34-44). The third quarter made the Palau believe in their team as Pesic’s team defended with real intensity and reduced the gap. A Hanga smash and three pointers from Claver and Moerman made it 49-50 in the 26th minute. Baskonia kept calm and re-established their lead as they were eleven points ahead with five minutes to go (59-70, min 35). When it seemed like the game was over, Barça dug deep for one last push. Heurtel reduced the disadvantage to five before a three pointer from him with a minute to go left Barça only three points behind. Moerman and Claver then produced the necessary baskets to draw level at the death in an exhilarating final minute which forced extra-time. The blaugranes did everything they could to try and force the fifth game as Tomic and Navarro put them ahead for the first time in the game. However, Baskonia were too strong for them and the final result of 88-82 saw the Basque side win the game and the series to book their place in the final of the Endesa League.